Following our meeting with the Queen at Buckingham Palace in July, we formally received our second Queen’s Award from Her Majesty’s representative for Cheshire, Lord Lieutenant David Briggs. The Lord Lieutenant presented the award to our Chairman, Ted Darton at the ceremony held at the Mere Court Hotel in Knutsford on 30 August. The attendees included Fiona Bruce MP, the High Sheriff of Cheshire and the Mayor and Mayoress of Cheshire East. 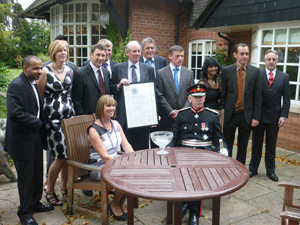 We are one of only two companies in the North West of the UK to have received a Queen’s Award in 2011. Ted Darton has received six Queen’s Awards over his career, which David Briggs suggested was probably a record. You can read more about the event and the significance of the award in articles published in the Middlewich Guardian and the Crewe Chronicle.